Hello? Where am I? Oh, this is the real world. Apologies, I’ve been in the postapocalyptic wasteland of Boston – ravaged by a nuclear war or several sports championships, but probably the former. Definitely the former, as this is Fallout 4. So grab your Pip-Boys (seriously, did you grab one in the three seconds they were available?) and join in. I’m going to take you into one hefty game. Before you become the Sole Survivor, life is good. Fantastic spouse, a healthy child, and the perfect house in the aptly named Sanctuary Hills, a sort of Bostonian suburb. When a Vault Tec salesman comes around, you get set up with a residency in Vault 111. The salesman knows the nuclear holocaust is coming, but doesn’t know it’s coming immediately. While you escape a major bomb blast, you aren’t living in a comfortable confinement. Instead, you’ve been cryogenically frozen along with your family and several others. Two-hundred-and-ten years later you awaken from the sleep, only to see your son being ripped from the thawed arms of your spouse. Thawed out as well, you aren’t quick enough to catch what looks like a bounty hunter but soon find yourself on the hunt for your son through the wastelands of the Commonwealth as the Sole Survivor. 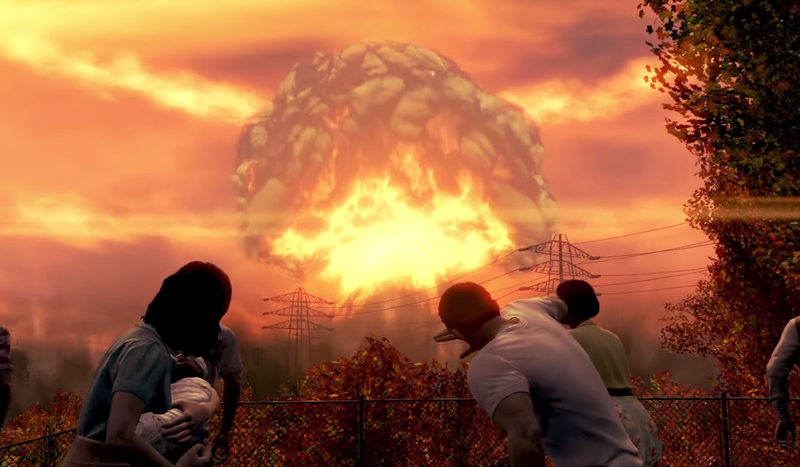 Fallout 4’s basic intent is to be a family story. How far will one go for their child? What are the ramifications of that find? It’s certainly there, that story. At times very much on the surface but often getting lost in a vastly radiated world. The problem with being the Lone Wanderer is needing the help of others and subsequently getting caught up in their plights. 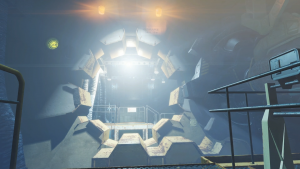 Your story can get relegated to the underground molerat caves or out to the Glowing Sea. Now it never entirely disappears. There were always hints in many dialogue trees upon meeting most new people in order for me to tell my story. In fact, the way I played through helped me in some cases. But soon, there would be another settlement to clear. Another piece of technology needed to be acquired. Or just some ghouls being jerks. All groups sharing a common enemy, depreciating your story for the greater good. But just whose greater good? Without jumping into major spoiler territory, Fallout 4 truly becomes more about what can be considered life and how important can it be. There are various clashing philosophies and your family story fits in interestingly into the mix. 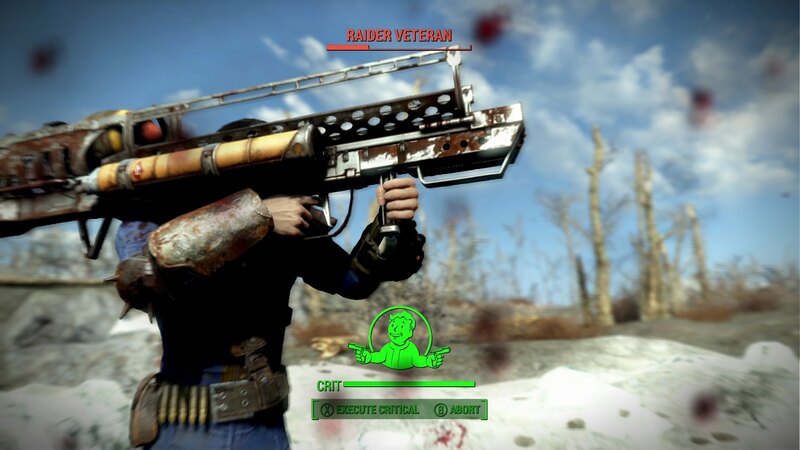 Perhaps to no surprise, Fallout 4 is a huge game. Using a modified version of the same engine Bethesda used for Skyrim, the game provides an incredibly involved world to be a part of. I spent nearly a half hour alone attempting to create the most accurate version of myself in the game. We’re talking not just choosing an entire ear or eye setting. No, we’re talking about adjusting the several options on your ears; various parts of your jawline; and so on — all while your spouse comments one way or the other about your choices. Do you have to get so particular? No, but there’s a certain fun in it. Between release and this writing, I’ve seen some great character replications online (and I kicked myself for not recreating Sterling Archer). But it sets the table for what you’re about to get into. Something very S.P.E.C.I.A.L. Special meaning Strength, Perception, Endurance, Charisma, Intelligence, Agility and Luck. Different this time around is the ability to spend points in each area and either build up each skill or unlock perks, eventually able to diversify the deeper you get. I liked the system quite a bit, as it allows a good initial set of balance, should you so choose. I found it very accommodating to multiple styles of gameplay even as you continued to upgrade without a level cap. For example, you can move through the game very balanced and take advantage of your companion abilities (more on that latter part soon), be a charismatic fiend who smooth talks his way through the wasteland, or be a heavy hitter. The choice is yours. 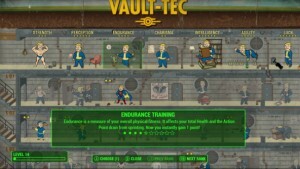 Finding bobbleheads and a variety of periodicals along the way will also boost skills and perks, which will be needed because this game can be hard. It’s an unforgiving game at times. Much of the story will ease you into things, but wandering too much of the wasteland early on can be dangerous. Soon after coming across a helpful group, the Minutemen, I stumbled into a fight with a Deathclaw. I was perhaps level 3 and in no immediate shape to take it on. It took a few tries before taking it down. Other quests I took part in would offer similar surprises. The most difficult bosses or creatures will have either a star or skull next to their name as a clear indicator that you probably aren’t ready, or you’re about to spend a ton of ammo. It’s a jerk move for the most part but there are some silver linings. Namely, you can get a ton of experience points and get rewards. Legendary kills often supplied triple the experience points and always a high value weapon. Those points can easily get turned into building up perks to make your job easier. But alternatively, you can (and should) save very often, even mid-combat in many cases. That will allow you to figure better alternatives for the right or just run away. The latter actually beneficially glitched me into having a secondary companion for a time, but I’ll get into wonky mechanics later. What will help during combat is an improved VATS system. It never felt like a chore to use or too much like a turn-based game. In Fallout 4, it’s more like a Matrix-style bullet time. Time will slow and you’ll have the ability to select a target and a specific area to target. You’ll be given the likelihood of success of your attack, so you’ll know whether it’s easier to bail and start shooting from the hip. VATS can also be super helpful for simple exploration or finding enemies before they spot you. What VATS won’t help with is directing your companions, which can be a big help despite that limitation. Dogmeat, making his return from previous Fallout titles, will be your first companion, but there are several others who can join your cause and each can serve good purposes. Nick Valentine, a Synth old-timey detective, can help hack advanced terminals. Dogmeat can rip apart enemies or find items for you. Who doesn’t love a dog who can bring you a gun? That’s one fine dog! If you’re carrying too much, you can throw some items their way. I used it as a way to carry extra weapons into battle. But a bigger feature is the ability to interact with the companions. As your Sole Survivor can actually speak this time, it opens up a new type of dialogue tree in order for you to build up relationships or create a better experience with anybody you can interact with, friendly or otherwise. It’s not the greatest dialogue, though. UI-wise, it’s fine, but the dialogue itself can come across as plain or just odd. When I would dismiss a companion, just for normal circumstances, my character came across as a kind of a jerk. It would just throw a wrench into the attitude I wanted to present otherwise. To touch back on how huge Fallout 4 is, nearly everything in the game can be interacted with. Weapons or resources can be found within very obvious parts you pick up, like direct steel or wood, or within small items like toy rocketships and teddy bears. You can literally build a gun that will shoot a teddy bear that can kill an enemy and not entirely in the comical way a game such as Dead Rising presents it (though still pretty funny). At many settlements, there are workshops and stations to build resources, create chemicals, cook food, and create modifications for weapons or armor. Perks will allow you to share resources between settlements, which can become clutch and allow you to dump junk off and free up your carrying weight limitations. It’s necessary to the game but sometimes overly so. Building up settlements can offer up more support for you later in the game and offer more safe spots, but there can be almost too many to find and help keep safe. It can take away resources such as aluminum, plastic and circuitry, which are some elements needed to make weapon mods or fix your power armor. Power armor is of course one of the most famous pieces of Fallout equipment. It’s certainly still armor, but I found it to be something more useful than just a bullet deflection device. You can use it to travel through highly irradiated areas without suffering too much. I found it to also be an improvement over a somewhat difficult to see Pip-Boy interface. The Pip-Boy, arguably just as famous as the power armor, offers a narrow view, despite how helpful it can be for navigation, inventory, and the like. Using the Pip-Boy with power armor creates a much more visible situation for you, so it’s good to wear it. 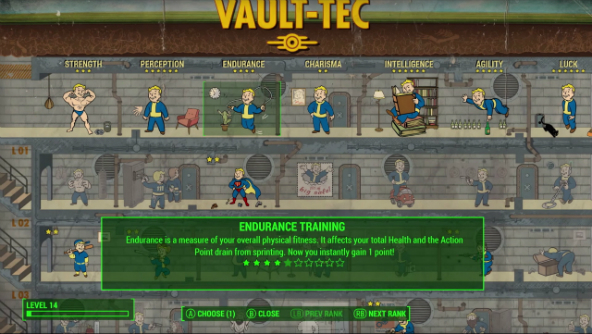 Beyond the UI, Fallout 4’s mechanics can go from smooth to wonky in a matter of moments. As the Sole Survivor, you can move around in good fashion. Sneaking works well, for example, and perhaps too well in some cases. But, then, some random glitch will create a WTF moment. One of my bests was when I had Dogmeat as a companion and he threw himself down an elevator shaft seemingly on purpose. He appeared safely a few moments later, as companions are wont to do if they don’t immediately follow you or get stuck elsewhere. Perhaps that’s to be expected in such a large game with a lot of moving parts. I didn’t experience any debilitating experiences during my playthrough. As touched upon, I “glitched” the game into allowing me two companions once I couldn’t defeat a set of Mirelurks (because difficulty surprise! A Queen Mirelurk that required three mini nukes). I took off but the extra character, who can be used as a companion but wasn’t my current one, followed me. I couldn’t interact much or hand off items, but he certainly helped take down a lot of enemies. The most baffling situations I encountered were with a normally steady VATS system. There were times where shots were complete misses, despite being in close, wide-open range. Fallout 4 is one hell of an interesting game. It has this significant way to pull you into its depth. Once you get going, you’ve suddenly been playing for hours and you may have just spent a lot of time walking around, finding more of the city, and shooting things. But somehow, it never gets boring. A chore, yes, but boring? No. It’s immersive and it does more to keep you interested and engaged than it does to alienate you from playing. It’s an insane package that can easily can net you $1 per gameplay hour if you spend that much time exploring and taking on quests (and if you want to equate value that specifically to what you would pay for the game). 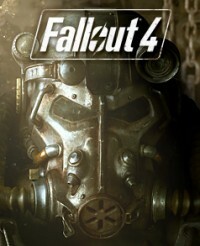 And perhaps one of the major developments over Fallout 3 and New Vegas? Fallout 4 doesn’t have a hard end. You’ll be able to keep exploring the wasteland well after you’ve completed the main story. There are insanely detailed stories or situations to find your way into, regardless of whether they serve a direct purpose to the main story. Fallout 4 is the type of game that you suddenly find yourself living in rather than playing casually. The game that will take up your S.P.E.C.I.A.L. time while all else falls by the wayside. And that is sometimes all you can ask for from a game. 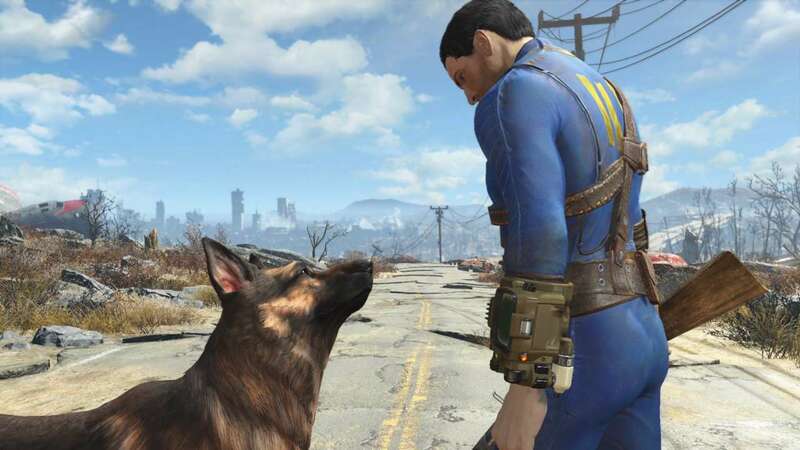 A copy of Fallout 4 for Xbox One was purchased by the reviewer. Played to main story completion and roughly 55% of the overall game in approximately 55 hours.